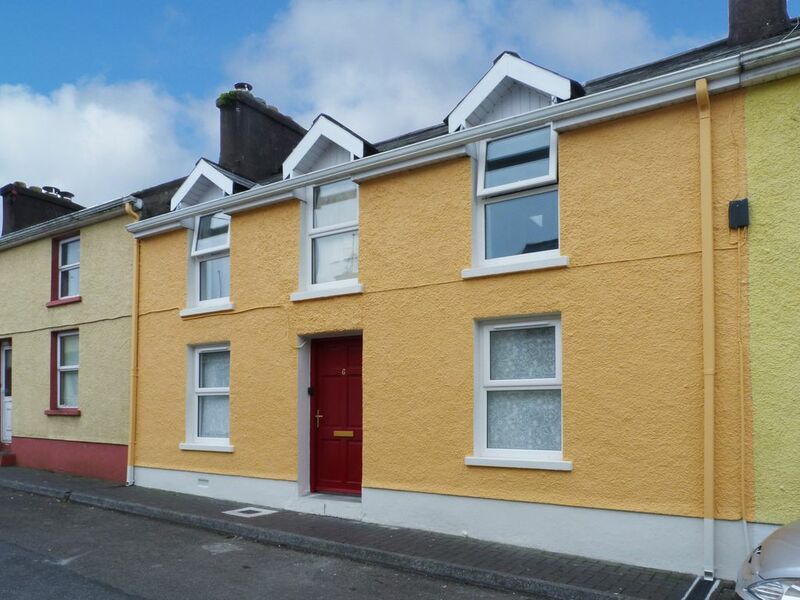 A cosy home located in the heart of Kinsale town gourmet capital of Ireland, 30 minutes from bustling Cork City. Beautifully finished throughout providing a homely and comfy holiday base for families and friends alike with the added bonus of free Wi-Fi and a welcoming wood burning stove. Kinsale is a superb tourist hub with many bars and boutique shops, as well as a busy harbour. A little further afield why not visit Killarney National Park, bustling Cork City, Blarney Castle or Fota Wildlife Park to name but a few. An idyllic location at any time of year!Shop. Pub. Restaurant 264 yards. Beach 2.6 miles. GF: lounge, kitchen/diner. FF: 3 doubles 1 with ensuite shower room, bathroom with shower over bath.Electricity included , storage heaters, wood burner with starter pack, linen and towels included, cot, high chair, stair gate, satellite tv, dvd player, radio, fridge/freezer, microwave, dishwasher, w/machine, internet access, hairdryer, welcome pack, fully enclosed garden, garden seat, on street parking. Sorry no pets. Perfect location, clean, stylish, comfortable! I loved this property! The location was ideal for exploring Kinsale, walk to everything! The apartment was very clean, tastefully decorated, comfortable, plenty of dishes/glasses and the guest handbook was very informative and helpful. There was a loaf of bread and package of biscuits on the counter, milk in the refrigerator and tea was provided. There is a little stove in the living area and two logs were provided for us to use, but it was such lovely weather, we hadn't the need! The in-suite shower drain was clogged and not draining. I called the housekeeper and she couldn't have been more apologetic and accommodating. She said she could come later in the afternoon, I told her we would be out, but were ok with her coming in. I had also mentioned that we didn't have a sponge for washing dishes and she said she would bring that with her as well. I told her we had a pile of dishes on the counter just waiting to get a sponge for washing, so please not to mind the mess. When we returned she had put all the dishes in the dishwasher and ran the cycle! The shower tub drain was fixed, she left a sponge and some coffee packets. Very responsive.